Here at Experian Marketing Services, we are always talking about how consumers are changing. They are connecting more frequently, on more devices, every day. This trend is especially relevant to those in the travel industry. People are increasingly comfortable researching trips, reading reviews and even booking vacations online and on mobile devices. 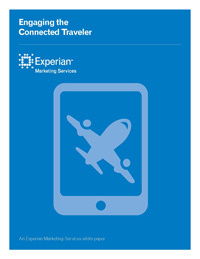 We’ve identified a consumer segment that is particularly fond of these trends: the Connected Traveler. Connected Travelers are frequent travelers (they’ve taken at least 3 domestic trips in the past year or traveled internationally within the past 3 years). They are tech savvy, spending at least two hours each day on their smartphones, and they have money that they love to spend on travel—30% spent $1000 or more on their last domestic trip, and 35% spent over $3000 when traveling outside of the United States. Don’t rely on loyalty programs – 40% belong to frequent flyer programs, but over half of those are members of two or more loyalty programs. Make sure your offers are unique to keep customers with you. For more insights into this highly important customer segment, download our report.